Saint John folk duo Tomato/Tomato lead the way in this year's nominations for Music New Brunswick awards. The husband-and-wife team has grabbed six nominations, including those for Album of the Year, Group Recording of the Year and Song of the Year. Acadian folk performer Joey Robin Haché is next with five nominations, including nods in Enregistrement de l'année and Chanson de l'année (Francophone album and song of the year. Veteran Moncton pop/rock performer Jared Lutes also landed five nominations, battling in Album, Solo, and Song of the Year categories. A total of thirty awards are going to be handed out in both the performing and industry sides of the music scene. The awards gala will be held in Moncton on October 15, as part of a four-day event presenting the best in New Brunswick music, from classical to Aboriginal to electronic. The annual Director's Lifetime Achievement Award will honour the late Marc Chouinard, who passed away this past February. The long-time director of Moncton's Capitol Theatre was a tireless supporter of arts and culture for Acadians and for New Brunswick, and was an industry leader in the music community. As always, provincial music fans get a say in the awards voting, in all the major categories. Voting begins online at www.musicnb.org on Monday, September 21 and ends on Friday, October 9 at 12 noon. 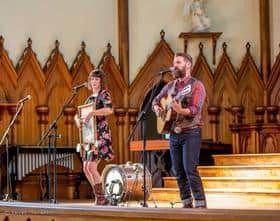 A detailed list of all the nominees can be found at the Music NB website as well, plus information on tickets to the gala and shows coming up in Moncton.